This gorgeous rustic display unit can be used for a variety of purposes to suit your style. From being placed on a mantel piece with pillar candles in, positioned on a garden wall with growing ivy through, to hung on a wall displaying your favourite plants; you will get so much use out of this caged display. Made from rustic iron, finished in an antique brown, with a fleur de lys to the top, the display cage adds some rustic glamour to your home. A lovely gift idea for a keen gardener. This gorgeous rustic display unit can be used for a variety of purposes to suit your style. From being placed on a mantel piece with pillar candles in, positioned on a garden wall with growing ivy through, to hung on a wall displaying your favourite plants; you will get so much use out of this caged display. Made from rustic iron, finished in an antique brown, with a fleur de lys to the top, the display cage adds some rustic glamour to your home. A lovely gift idea for a keen gardener. 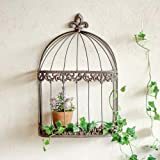 This entry was posted in Birds and tagged Bird, Cage, Display, H44cm, Mounted, Newest, Plants, Shrub, Unusual, W29cm, Wall by One Boutique. Bookmark the permalink.